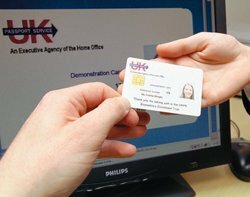 ID cards will no longer be compulsory, but anyone applying for a British passport will added to the national identity card database, the government disclosed yesterday. "Holding an identity card should be a personal choice for British citizens - just as it is now to obtain a passport," he said, announcing a review of the plans. Johnson said he still wanted to see the introduction of ID cards accelerated for foreign workers and said young adopters would benefit from using the card as proof of age. However, he said he had halted the introduction of compulsory identity cards for pilots and other workers at Manchester Airport and London City Airport. Johnson has also scrapped plans to extend compulsory ID cards to other transport industries as a condition of employment. But draft regulations to be approved by parliament in the next two weeks are expected to make passports a "designated document", according to The Guardian. This means anyone applying for or renewing their passport from 2011 will be included in the national identity databases automatically. Data privacy and security concerns around these databases are among the chief reasons for opposition to the ID card by the Conservative Party, human rights groups and other critics.